The critically-acclaimed and highly-original sci-fi thriller Ink comes to DVD on April 25th, shot on a next-to-nothing budget but becoming one of the buzz films of recent years. The film has been compared Inception, The Matrix and Donnie Darko, but a unique vision from writer/director Jamin Winans ensures Ink impresses on its own merit. I caught up with Jamin to find out more about shooting on a budget, disappointing test screenings and the joy of seeing two years hard work finally pay off. 1) First up, fantastic job with Ink. How did you come up with the story and setting? Thanks a lot. Stories for me usually start as one image and then build from there. With Ink it was an image that started when I was a little kid. When I was four-years-old I had a pretty big crush on Snow White. But nothing terrified me more than the witch (in old woman form) in Snow White. I would have lucid dreams that the witch would sneak into my room and kidnap me while I slept. So that image stuck with me a long time and apparently as an adult I’m still afraid of her. I started asking questions of how that witch or monster kidnapper came to be. That eventually developed into the story of Ink. You’ll probably notice that Ink still looks a lot like the witch in Snow White. 2) You capture a truly mesmerising look to the film on a small budget – how tough was it working with such limited resources? It was a blast! Just kidding, it was hell. We actually had a very long shooting schedule for such a small budget (83 days), but the way we made that work was having a very small crew. We were operating with a base crew of about 10 people, but a several days it was just three or four of us. Having such a lean crew can really have it’s advantages, but the disadvantages were that we were all working way too hard for too long. I remember being three days into the shoot and wanting to die and we still had 80 more to go. Fortunately, to the credit of our cast and crew, we persevered and are really happy we did. always coming up with creative solutions and ideas. In the end I wouldn’t change a thing. Ink is Ink because it is low budget. 3) The attention to detail is excellent and the Incubi have a distinctive style – did you sketch out the characters first? Thanks again. We did do a lot of concept drawings, but largely found our character’s looksby experimentation. I had the idea of the incubi “masks” early on, but really didn’t know how we would achieve it. One day, our director of photography, Jeff Pointer, and I went to the hardward store and bought a bunch of materials and just started building mockups. We came up with a design and I did some rotoscope testing and we loved it. With Ink himself I had a very clear vision of what he should look like from the get go. So Kiowa, my wife and producer, and I started building that costume in our living room about nine months before the shoot. We would spend our evenings watching TV and sewing pieces of rags together to make a cloak. Indie filmmaking at it’s best. 4) What’s your favourite scene in the film? [Spoiler alert – please skip if you’ve not seen the movie] I think the moment when Emma recognizes that her father is actually the monster and yet still chooses to love him hits me the most. Both actors in that scene really move me. I remember shooting it and trying not to cry like a baby. I also love the moment when Allel is back to back with John in the hospital room fighting back the incubi. That was an image that I saw very early in the process and it was great to see it play as well as I hoped. 5) How did the cast take to the film? They look like they really believed in your vision. It’s really funny, I don’t think any of them really had any idea what they were making except for Chris Kelly. I had worked with Chris a lot in the past and he too is a writer so he gave me a lot of good notes on the script and really understood the vision. But everyone else did just seem to trust that I knew what I was doing. seemed to be shocked. Part of it was that it didn’t look anything like they expected, but I think part of it was that really avid fans were coming forward after the fact and wanting autographs. I don’t think anyone expected it to have such an impact. 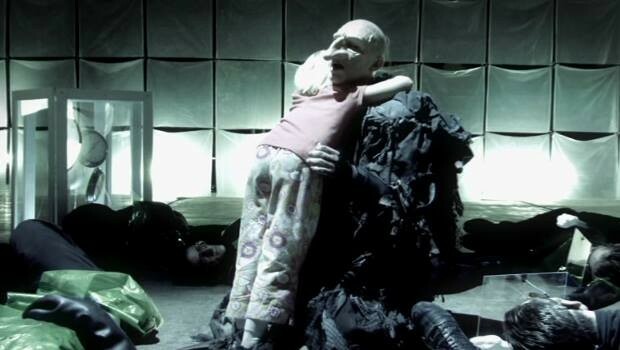 6) Ink has been likened to The Matrix, Inception and Pan’s Labyrinth. Do you think they are fitting comparisons? I do think it has similarities to all those movies and it’s a huge compliment that anyone would think so. The movie I think is the closest comparison is Alex Proyas’ Dark City which I believe was also an inspiration for Nolan’s Inception. Dark City really blew me away when I saw it and opened my mind a lot to the possibilities of film. 7) The soundtrack is dreamy – how did you go about it’s composition? Thanks. I actually don’t consider myself much of a musician, I’m a horrible pianist, but I generally have a good feel for the tone I’m trying to create. I’ve found it’s easiest to just sit in front of a piano and fiddle until I find the right piece. One day we’ll be able to afford a real musician. With Ink I actually wrote about half the score before shooting so that we had music to work with on set occassionally. It was crucial for scenes like Jacob’s chain reaction. Since I edit as well, it allows me to bounce back and forth between the two and create more musically and rhythmically driven scenes. 8)What kind of reaction did you get from the first screenings in 2009? Our first screening was really weird. I was sitting in the theater and about halfway into the film I was totally panicked. I thought, “This is a disaster and everyone hates it”. It was on odd screening because there were a lot of family-type people there who weren’t exactly our target audience. When the credits rolled it just seemed like it was a disaster. We did Q&A after the fact and the questions were strange and my spirit was just crushed. The actors were all stunned, but I couldn’t tell if that was because they loved it or were surprised how bad it was. very calmly that he liked the film and was going to write a review. Regardless, my wife and producer, Kiowa, and I went back to the hotel convinced we were dead. Then the next day I was at a producer’s panel at the festival and I got a text from Chris Kelly that the Ain’t It Cool News review was out and unbelievable. Then other reviews started popping up and they were great. The festival gave us an additional screening the next night and suddenly the right crowd was in the audience. At Q&A people were ecstatic and one girl who was asking questions had already seen it at the first screening, was back for the second and was planning on coming again for the third screening. I was practically in tears when she said this. It was two painful years of our lives so nothing meant more than someone who loved it so much. More and more reviews came out and buzz just grew and grew. It makes me laugh to think about now. What a jouney. 9) You had trouble getting distribution for Ink originally, what difficulties did you encounter? I think above all else there was just a real disconnect between distributors and the audience. The audience really loved it, but distributors weren’t picking up on that. The indie industry was in peril at that particular moment too so nothing was getting sold and certainly not for much money, but regardless Ink was a film that seemed too risky for them. I think everyone respected it, we even did a lot of general meetings about our “next film” with all the studios, but Ink was too weird and too low budget for most. The offers we did get were crap so we ultimately decided to release it ourselves initially and of course the piracy suddenly helped it blow up. 10) Ink had unprecendented attention when word-of-mouth started spreading, how much of a turning point for the film’s fortunes was that? We literally had no marketing budget so word-of-mouth was everything. We used all our free resources we could like trailers on YouTube, Facebook, and Twitter, but in the end it was our fans who brought the film to another level. After a while our promoting was just a drop in the bucket compared to what our fans were doing. It was honestly incredible to watch and only something that could happen in this day in age. Word-of-mouth has, of course, always existed, but it’s never had as much power and as far a reach as it does now. 11) Do you think this is this a rare example of piracy paving the way to a film’s success? I do think piracy was a big help, though I think Ink was spreading regardless. Piracy just expedited the process. In the end it’s not the form in which a film is distributed, it’s whether or not a film has an audience. I can’t imagine being able to repeat the same phenomenon. It was just the right film and the right chain of events for piracy to have worked. 12) What’s up next for you? Any plans to follow up Ink with another film featuring the Storytellers and Incubi? That’s a question we sometimes get from fans, but we’re really happy leaving that world as it is. We are actually getting close to making our next film which is also a sci-fi/fantasy. It’s very hush-hush at the moment, but we’re very excited about it. We’ll probably start talking about it a bit more in the next couple of months so for all your readers, the best way to hear about what’s happening is to follow us on Facebook. Just search “Ink”.